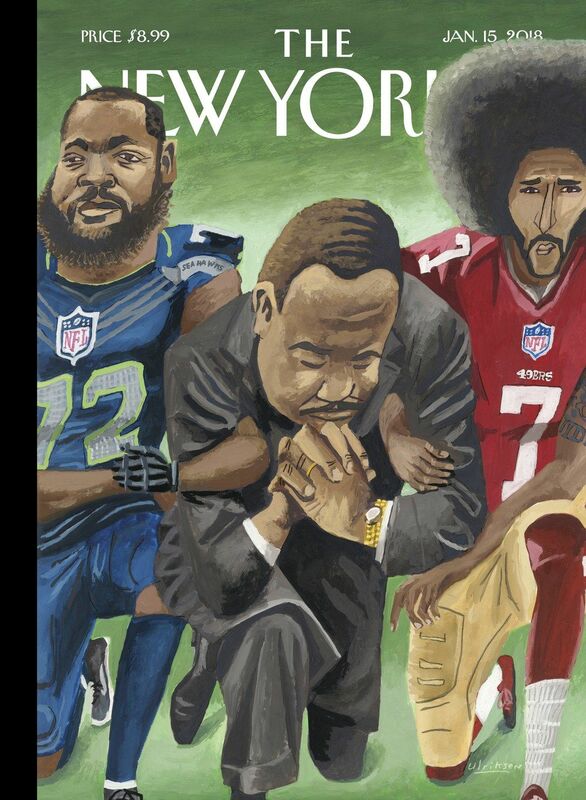 Artist Mark Ulriksen’s cover for this week’s The New Yorker magazine features a poignant illustration of civil rights leader Martin Luther King Jr linking arms and kneeling alongside NFL stars Colin Kaepernick and Michael Bennett, referring to their political activism against racial discrimination. The illustration, showing Martin Luther King Jr in a suit with a solemn head bent and hands clasps as if to be praying, was published by The New Yorker today. The civil rights leader proved inspiration for this week’s cover. The cover’s title, 'In Creative Battle', draws from Martin Luther King Jr’s 1964 Nobel Peace Prize acceptance speech, in which he spoke of a "creative battle to end the long night of racial injustice." The illustration refers to the 'Take a knee' anti-racist protests among American footballers last year, a symbol against police brutality and racism throughout the US. US teen athletes joined NFL stars in kneeling before a game while the national anthem was being played out, which sought strong criticism from president Donald Trump. The magazine’s San Francisco-based art editor Francoise Mouly says, "I asked myself, What would King be doing if he were around today?" in a post to The New Yorker website. "This is 49er country, and my mom and I have been going back and forth—she’s upset that players have brought politics into sports, but I say, How would you feel if you had to show up at work every day and salute a country that treats black people like second-class citizens? I’m glad that Colin Kaepernick and Michael Bennett are making it political. I’m sure that if King were around today, he’d be disappointed at the slow pace of progress: two steps forward, 20 steps back. Or ten yards back, as the metaphor may be." Mark Ulrikesen is a freelance artist and illustrator who specialises in figurative work. He’s been a regular contributor to The New Yorker since 1993, with more than 45 magazine covers to his name.